I presume they are software bandwidth upgradable? Interesting about the overload recovery time. Do they really mean 0.5 PERCENT the recovery time of other scopes? Some years ago, we bought Rigol's flagship: the DS6104, including most options (uart, spi, i2c decoding etc.). I get randomly the response: "command error". This blocks the connection for 5 seconds and a timeout occurs. This happens randomly, and when it happens, it does after sending different commands. So, it's not related to one and the same command. Sometimes the program runs fine for minutes. Apply a squarewave of 1KHz to channel 1. Set triggering to normal, rising edge. Set the memory depth to 1.4Mpts. Acquire the signal, then set the scope to STOP mode. Download the waveform in RAW mode, format BYTE. This bug happens when the probe attenuation is set to 10:1. These bugs are still unresolved and make it impossible for us to use the remote connection. We have learned our lesson and we will never buy Rigol stuff anymore for our business. I think there are quite a few things interresting about this scope. It finally has some functions now performed in hardware instead of in software unlike all the other scopes from Rigol. Decoding beeing probably the most useful out of them. The decode function in all rigol oscilloscopes at least up to the 4000 (i am not sure about ds6000) series is in my opinion barely usable. It just slows down too much and has a lot of actual glitches in the data because the software has problems to correctly decode the on screen waveform data. Hopefully the implementation in hardware is executed good enought, under this circumstance this would be a pretty big selling point for most people i think. Also if i understood their marketing correctly math functions are also now completly in hardware. This would negate the huge loss of responsiveness from the ui while using math. could i see it in their marketing videos showing off the math functions. So I assume it is not implemented in this model or it is missing in the documentation and i overlooked something in the video. Would be something interesting to look up if anyone here gets their hands on this. This function was quite useful from time to time, so it would be a bit dissapointing if it really was missing. "[...] Simple activation via software code (memory is already build-in). Please specify the serial number of your oscilloscope, [...]." So its safe to assume that all options are again activated with codes generated from the serial number if the description on the distributors store is correct. really high update rate + hardware decode. But I wonder how responsive the touchscreen and the overall UI will be. With 8bit input you get 8bit output. Any advanced math co-processor or any fastest ASIC cannot change that.. Depending on the particular way the 8-bit input is produced (needs to have suitable level of uncorrelated noise), the desired math done, and the bandwidth needed, yes, they can produce more bits from less input bits. Basically the samples/bandwidth/time -to- more (effective) bits -tradeoff. The first example that comes to my mind is the FFT done while ERES is enabled, giving (slightly) lower noise on the produced FFT, etc. Damn.. this new scope is really messing with my head. I wanted to get a DS4024E with 200MHz BW but now the DS7014 seems just so attractive. Sadly I could only afford that scope with 100MHz BW and now I am struggling really hard. for the higher BW or should I get a DS7014 with 100MHz BW? I hope I asked this question at the right place...sorry if I did not. I have a ds4k scope and while it has served me very well I think it would be a big call to buy one now. It is quite dated and while it can grab data fast any of the new scopes beat it on the processing of that data. I would go with the new guy. For a 50MHz clock signal you'll need at least 200MHz to see some harmonics an have a clue about what the square wave looks like. 250 to 300MHz is even better. Still when spending this kind of money it is wise to look at other brands or even used. Read Karel's post carefully. For a 50MHz clock signal you'll need at least 200MHz to see some harmonics an have a clue about what the square wave looks like. 250 to 300MHz is even better. Still when spending this kind of money it is wise to look at other brands or even used. Maybe the DS7k series will also have some hardware hacks to push up the BW limit. If you really want a nice touch screen and ASICs then buy an R&S RTB2000 or RTM3000 series. At least these scopes work and have 10 bit ADCs. 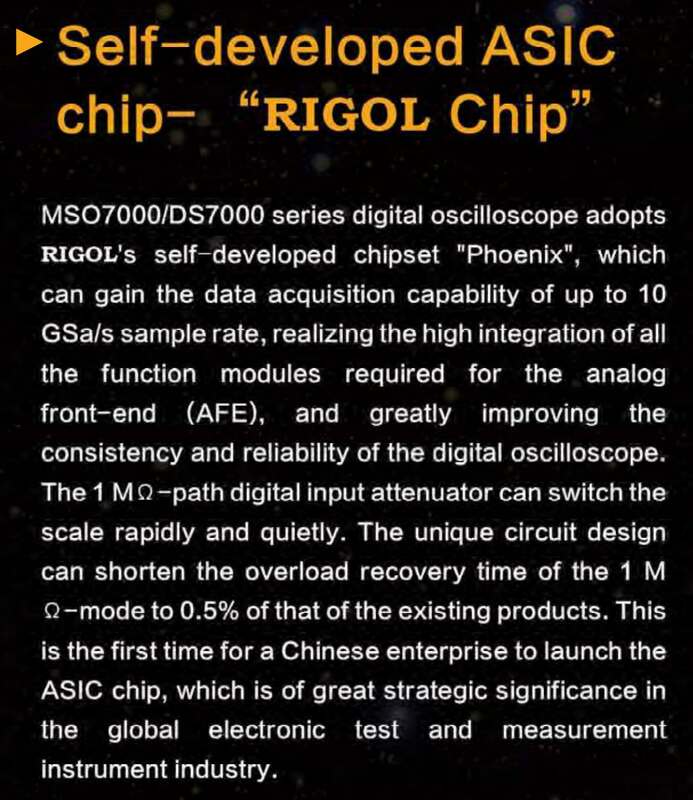 AFAIK this is Rigol's first ASIC based scope and it may have some issues. I wouldn't want to be an early adopter for new technology which can't be fixed by a software update. You definitely have a strong point in that regard! But I do not really need the 10 bit resolution and when it comes to the rest then the Rigol - at least on paper as far as I can see- is the clear winner when it comes to price and performance or am I missing out on something important that I can't see? Yes. There are many pieces of test equipment which look great on paper but don't work in real life. I really see what you mean and I went down the same rabbit hole already. A couple of years ago I spend over 2000 euro on a newly introduced oscilloscope which didn't work and I was foolish enough to believe the manufacturer (in this case Siglent) would fix the firmware soon. I ended up throwing it in the trash (=money wasted) and bought a different oscilloscope because I needed an oscilloscope which works. Again: read the posting from Karel. His experience is very similar to mine. If you want a piece of equipment which works then stay clear from Rigol and Siglent. They don't test their firmware at all. Sure the A brands slip up too but A) too a far lesser extend and B) they make things right even if it means taking the hardware back and fixing it. Sure the A brands slip up too but A) too a far lesser extend and B) they make things right even if it means taking the hardware back and fixing it. You forgot to add C) charge you 2-3 times what "B" brands do for the same (or less) features content. They don't test their firmware at all. Sure the A brands slip up too but A) too a far lesser extend and B) they make things right even if it means taking the hardware back and fixing it. This is quite true, but I get the impression that things are changing. I must say I was fairly impressed with Siglent's responsivness and quick firmware fix releases for SDS1104X-E (see the big thread). On the other hand you have stuff like Keysight's E36300A PSUs, bad standby & fan control design, long wait for firmware update and potential recall as AFAIR CH1 overshoot is still there. Or R&S having if I remember correctly fixed firmware release cycle (every quarter?) because dunno "we use SCRUM so f,.. you". Of course, overall, brand name stuff is still better, less bugs, better commercial support, repair service, providing spare parts for a long time after release and so on, but yet they charge for all that in much higher product prices (except the price of this Rigol scope maybe ). I am sure that the part about not testing their firmware is not true. All companies test their hardware, firmware and software before release. However they all don't have the same capacity for testing and so don't find and fix all issues prior to release. Different companies also will have different tolerances for what they will release as well. E.g. Keysight might delay a release due to a spelling mistake in the UI, but maybe Siglent would go ahead and fix it later. The problem is that it is impossible to test every combination of every feature. You would be there for multiple lifetimes. Nobody can do complete testing, but some companies can do better than others. For example if a company invests in an automated test framework, and then invests in creating tests for that framework for every new feature, and then invests in maintaining those tests as the firmware changes, then they have an improved testing capability vs someone who did not invest. Also, Keysight/R&S/Brand A have many years of experience of testing complex devices. They also have many experienced people who are able to use their intuition and discover bugs first before the public ever see them. Their ability to pull this off will obviously diminish as they lose these people through natural attrition, cutbacks etc and as the complexity of the instruments increases. They will need to adapt and no doubt they are doing so as this is pretty obvious stuff. I am sure that the part about not testing their firmware is not true. All companies test their hardware, firmware and software before release. The difference is that with Rigol (and Siglent) very basic functions are not working properly and new versions even break existing functionality every now and then. There is no other explaination for this other than that the testing is not performed in a structured way (= using a test plan and a software tester / software testing department) which equals to not testing at all. I must agree with this point. I recently got the SDS1204X-E + MSO option. The MSO is a new "instrument", but I went for this combination as it seemed to tick all the boxes for my needs at a low price. Plus, its "just" a few extra digital channels for a scope that is already used by forum members for a while, right? Unfortunately, the MSO is very problematic, and practically useless, too many bugs for me to live with. Whats more, I have no idea when it'll be fixed (if at all), and if so what the fix will "cost" in other parameters of the scope. Personally, I will think twice the next time before buying an instrument that doesn't have a proven track record. I have the good old Rigol DS1054Z and hacked it to 100Mhz with full features. Probably just one of thousands who have done this and found the scope to be good value because of its hackability. The scope has gone thru many firmware revisions with the latest being early this year. Pretty well sorted but Rigol still spell Pulses as Pluses, not exactly an issue but still no fix for a simple spelling error. The DS7000 appeals to me and probably lots of others like me that bought the DS1054Z, providing its hackable. If its hackable I would upgrade even though my 100Mhz scope meets my needs. What I'm attempting to say is if I am to upgrade to another 8 bit scope then it must represent great value for money otherwise I stay with what I have. I'm hoping Rigol will turn a blind eye to a hackable upgrade path just like it did with the DS1054Z. If this is possible then this scope will get my money and I'll upgrade. Look forward to seeing what pans out with this new scope from Rigol! DS7000 is potentially very powerful. A brands are only good because they tend to keep a platform for very long time. R&S new series is very buggy. Even with basic functions. No better than Siglent in my eye. But since R&S is an company that plans to sell these scopes for 6-7 years or even more, they will eventually fix all of it. And then, if you buy it then it will be rock solid. Most important concept here is to keep updating existing, already sold hardware. And not to churn out new scope every 2 years and never fix old ones. Until now Rigol (for instance) was playing catch up game. Trying to make scopes that will be good enough to compete with big boys. Making new platform every year or two. Learning and developing. Using existing A/D converters, FPGA etc. Trying different combinations to make it work and yet to cheap to produce. Changing things all the time. Experimenting. Giving up on the stuff that didn't work.. Meanwhile, Keysight (for instance) kept on producing same old Megazoom architecture (that's 10 years old) , building on 10 years old code base. It made sense for them NOT to change anything major. And since they knew they were in it for a long run, they made hardware with room to grow some and kept developing and debugging software. Don't be naive. It wasn't so they can give more to old customers they already gave them money. It is because they have to keep producing same old scope but make it look relevant and fresh. But not being idiots, in today's brave world of field upgrades, they let you download new versions. You like them for it. And it makes life easier for them, because they don't have to support bugs on 27 sub-revisions of software since it was released. Win- win. In 70s Honda was a cheap, mini hatchback crap that sold only because it was cheap. Chinese are just following Japanese method. How successful are they going to be, I don't know. But by judging what they did so far, we should not underestimate them. Until now Rigol (for instance) was playing catch up game. Trying to make scopes that will be good enough to compete with big boys. Making new platform every year or two. But Rigol have not released new oscilloscopes every year or two. They could've at least made it black or gold or something. I'm looking forward to reading/watching some independent reviews on this new scope. Dave when are you getting hold of one to tear down and review? Without serious and in depth reviews we dont know if the new DS-7000 series is buggy or up to spec! No one wants to be an early adopter of a brand new product featuring its own custom asic and feature set, without seeing some serious independent testing. Come on Rigol get some of these units out for testing in the wild!